Last year, oh that sounds so LONG ago, I finally got something finished in my sewing room. I made two Smitten with Mittens Table Runners. One for my parents and the other for my sister and her family. I shipped them off to their respective homes in December so they could be enjoyed during the holiday season. I started working on these table runners back in September. 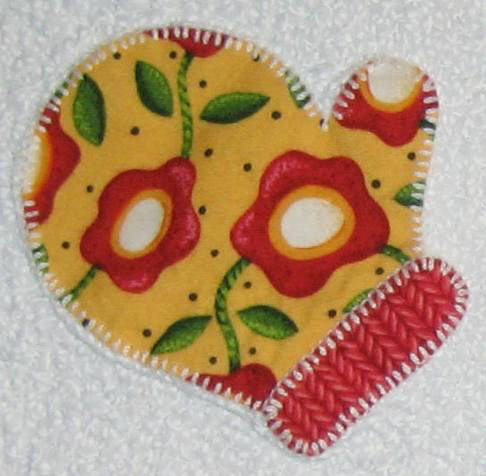 The mittens appliqué are from Erin Russek. You can read the original post, which includes the various links to Erin’s free pattern and tutorials, here: I’m Smitten with Erin’s Mittens. This was my first time using Aurifil’s 12wt cotton thread for the blanket stitch. I used a 50wt thread in the bobbin, a size 14 top stitch needle and lowered my tension to 2. It worked like a dream. Love the depth and texture it added to the mittens. I’ll definitely be using this thread again when I want some definition to my appliqué projects. I wanted the table runners a little longer, so I added 1/2″ finished yellow sashing and used up the leftover charm pieces to add side borders. The red border finished at 1″ and the green border at 2″. The table runners finished at 40″x16″. I stitched in the ditch around the blocks and all sashings. I did a small stipple in the blocks around the appliqué pieces. For the red border, since it was already stiched in the ditch, I just did a straight line down the middle. For the outer border, I marked where the binding would be attached then evenly spaced out lines to form the diamond shape. I did a simple crisscross design in the coloured sashing edge pieces. 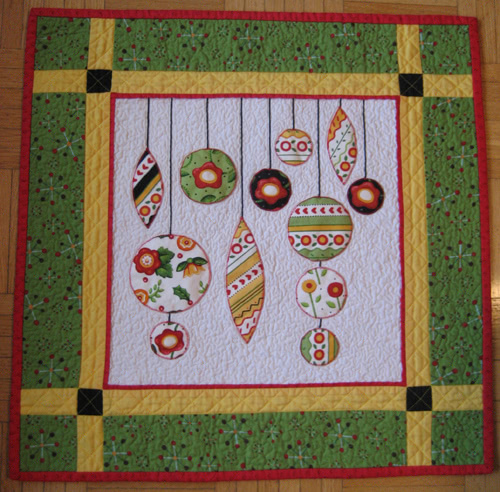 You might recognize the fabrics and colour scheme from the Christmas Ornaments wall hanging I did. This one I kept for myself, as it fits the round table in my kitchen perfectly. I suppose I should pack it away with the Christmas stuff and make something new for my table. I absolutely love these! I definitely will be making the Christmas ornament project. Just great! 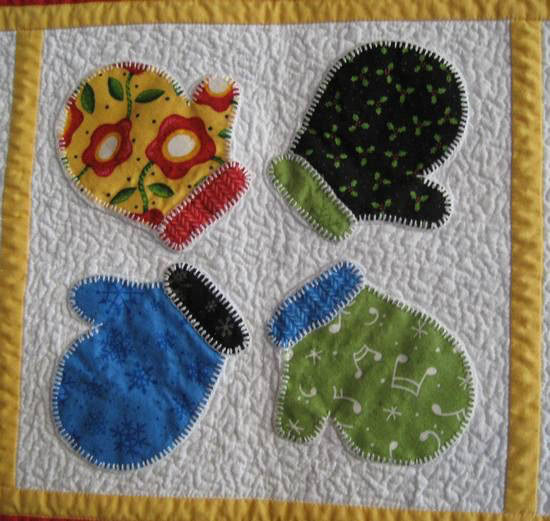 Too cute and the quilting just makes them pop! I love the mittens!! So cute!! That’s a machine blanket stitch? It’s beautiful! THANK YOU for the ornament pattern. I have been looking for something like this for my SIL. This will be perfect! Love the mittens. Thanks for the free ornament pattern. The mitten runner is darling. oh, those mittens…….love them! I must get me some Auriful!! Perfect timing on the “smitten with mittens” pattern. I made a resolution way before Christmas to not put away my Christmas fabric as I wanted to make several table runners but did not know what I wanted to make, now I know. I want to to the mittens using the on point method and also I might attempt the ornaments and do them them the same as the mittens just substitute on for the other. This will be a good portable hand stitching project. Thank you so much for the adorable patterns. I can’t start one more thing, not one more thing! 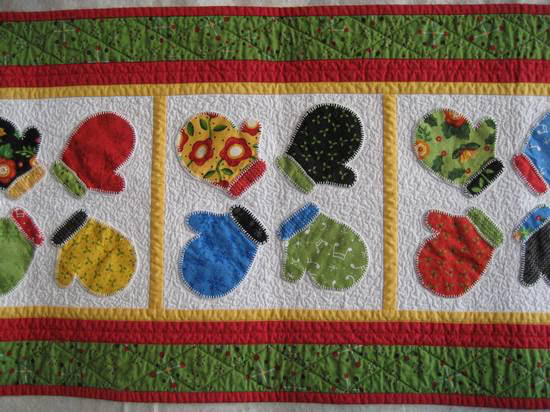 Well maybe just the mitten runner..I love it! Love the table runner, Michele! Your quilting is wonderful too. A beautiful job, Michele. Those mittens are so cute. I think I could make one or two of those table runners and get a head start on Christmas gifts for this year. Especially when I’m still in a festive mode.